Last week I got a text from the Children’s Pastor at our church. 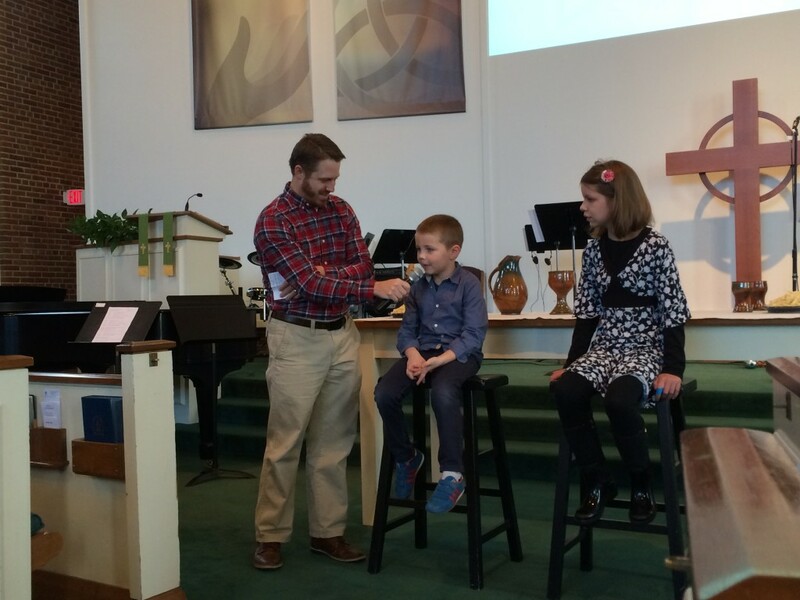 He was presenting a children’s sermon at church that Sunday and wanted to interview a few kids during it. He wanted to know if Wally could be one of the kids. Wally would just have to answer a few questions about an experience he had setting up pads for the PADS ministry at our church. I read the text over and took a deep breath. I wanted Wally to share his experience, and I understood that it would be helpful and fun for people to hear. But I also thought about his nervous twitch. When he started preschool at 3 years old, we made a huge deal about how exciting it was for him. He seemed ready to go, and he loved it. But every time we talked about it and asked questions, he started blinking rapidly. He’s always been a reward-driven pleaser, so he’d answer with enthusiasm, but he looked like he had an eyelash or 10 in his eye with each mention of his experiences. “It’s just nerves,” his teacher told us. “It will go away.” And within a few weeks, it did. We hadn’t seen this twitch for a while. He started Kindergarten this year, which he loves. He’s been good about telling us what he’s learning—he loves craft time (which really just means worksheets). He’s happy to go, he mentions a lot of friends, and since he has the advantage of a fall birthday, he’s among the oldest in his class, which means he catches on quickly to what they are learning. We hadn’t had trouble—so we were surprised when his blinking reappeared at dinner the other night. Then, in his story, he revealed some social changes that were flaring that blinking up: a girl had told him she loves him. Ahhh, nothing like the love of a 5 year old girl to throw you off your cool streak. The blinking has since subsided, so I was a little worried to throw a potentially blink-inducing situation his way. I get nervous to answer questions live in front of hundreds of eyes, so wouldn’t he? Any moment, I may start blinking myself imagining it. My instinct is to respond, “No, too scary!” Protection. Protection from those blinking thoughts. We practice with the Children’s Pastor the day before. Wally does a great job, unprompted, answering the questions. That evening I’m tempted to help him fill in the blanks so he gets it “right,” but I resist. We don’t even practice, in the name of keeping it cool—although practice would be what I wanted, if I were him. Practice—lots and lots of practice to push away the blinking—although I’m fully aware that practice would induce the blinking, so I resist. We get to church for the run-through before the service and he blanks on a few of the answers. My stomach clenches as tight as a toddler’s hand around candy he’s not supposed to have. I start blinking. I flash back to my own childhood—one of my earliest memories—where I was around Wally’s age and had 2 lines in a church play. One had 3 words and one had 5. I said the 3-word line and then peed my pants. My mom rushed me to the bathroom, and the part I remember with the most clarity is that, sitting on the toilet, between sobs, I asked her my biggest concern: who would say my 5 word line? Wally asks me to run through the questions a few times in the 20 minutes we have before the service. I do, and I ask him if he feels ready. “Sure,” he says. In the songs leading up to the Children’s Time, he annoys me, crawling around on the bench behind me. For once, this is a welcome distraction. His time comes, and he takes his seat on the stool up front. While everyone watches the first girl that is interviewed, I watch him. He sits nicely, makes funny mind-wandering faces, and does not appear to notice the hundreds of people who sit facing him. Although I am smiling like a crazy person in case he looks at me for reassurance, he doesn’t. And he blinks a normal amount of times. When it’s his turn, he does the job. He describes what he does at PADS, “I take out the PADS and the blankies and pillows.” (When he chooses to say “blankies,” I am secretly thrilled at the cuteness.) He answers that it is for the people who don’t have homes. He’s totally himself—a credit to the Children’s Minister who can make anyone nearby comfortable, and a credit to Wally’s funny ability to be logical and matter-of-fact. He handles it like an old pro because he doesn’t know to be scared. I sit and watch, and I am amazed by our separateness. And I realize—this wasn’t about his nervous twitch. This was about mine—a tendency to hold him too close. I am reminded of advice people gave me when Wally started Kindergarten. Now it is his day—not yours. You are Moses’s mom, sending him down the river in the basket, not knowing what to expect. He’s his own person, and you don’t get to put your feelings in him—he has a set of his own. Today, against my every urge, I kept my fears away from him. And because of that, I got to enjoy a feeling he had that I was lacking—his bravery. He handled the whole situation so different from me, from how I would have if I were him. He is his own little person, and so fully himself. That is so sweet. He’s growing up so quickly, but still says blankies. Gotta love it. You bring back memories of your first public performance:) So glad Wally didn’t repeat that! That was an amazing blog (I almost wet my pants laughing). I like his blinking acceptance of that girl who loves him …..believe me, Mollie, that’s the first of a long string of girls who will fall for Wally over the next several years. As always, you write so very well and capture the heart of it all. I’m convinced that performing in church was the key to my guys’ amazing self-confidences. Church is a safe place where you are loved regardless of “how” you perform. And with those eyes, girls may definitely become an issue, lol.